I love doing history units in the summer because a huge part of the learning is through historical fiction and that is quite conducive to doing poolside. We all grab our books and read them in between swims. I tend to do the read alouds inside in the morning on the couch and the silent reading usually happens outside. We’re just finishing up the Revolutionary War (from both US and British perspectives, and its impact on the colonies in present-day Canada at the time), and we’re going to start the War of 1812 shortly. 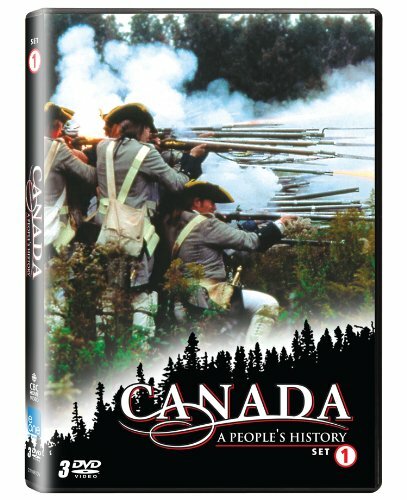 We’re doing a lot of reading & discussion and using Canada: A People’s History DVD’s that I bought on Amazon. You can get free lesson plans to go with the DVD’s here in English and here in French. I must confess that I’m using the English ones because I don’t think my kids are ready for vocab at that level in French. 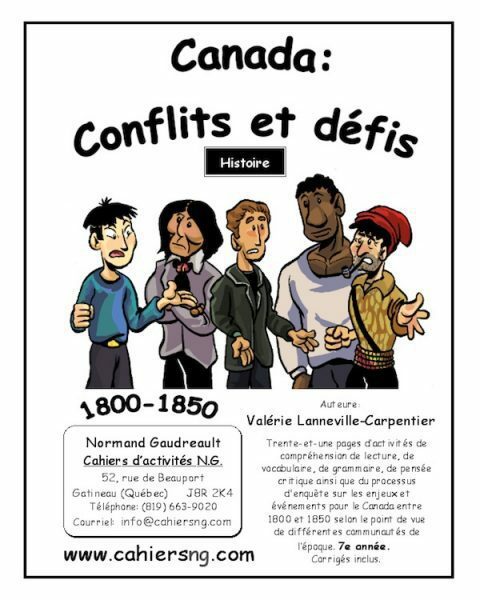 For our French part of the study, I found a book on Cahiers NG called Canada: Conflits et Défis that we are going to be working through alongside our English activities. When we get to the confederation part of our study, I plan to purchase La création du Canada & La Création du Canada #2. They have a book for 1713-1800 which we probably could have used during the Revolutionary War study, but we covered New France last year so I wasn’t keen on buying a book that we would probably only use part of. We read aloud a few chapters from a Cabane Magique (Magic Tree House) book a few times a week in the summer, taking turns reading a page at a time. My children are also required to read silently in French for about 30 minutes a day from a book of their choosing (I only veto stuff that I don’t consider appropriate for their ages, and really they don’t tend to pick stuff like that because the reading level is too high for them). They are both into the Warriors series by Erin Hunter and fortunately our library carries those books in French. We’re finishing up a series by Guérin – Volet sur le français and Je Grandis en français. These books have short stories and question/answer workbook type responses to go with the stories. Over the summer, we’ll do one story a week or so. My children also independently work through one story a week from Questions de Textes by Envolée and I correct their work. French: We will continue our work in the Grammaire de Base and Mon Babillard series, probably doing one lesson at a time (about 15 minutes) 2-3 times a week depending on the weather. English: My son is working on Bob Jones Grade 5 English – just the grammar sections. He does a lesson (about 15 minutes) once (maybe twice) a week in the summer. The writing parts of these books are not great so we skip them. I stop teaching English grammar after grade 5, so my daughter (going into grade 7) doesn’t do any English grammar anymore. I focus my energy on good communication and writing, which means that they are practicing their grammar and skills all the time – they just aren’t diagramming sentences anymore. English: My daughter is working through the Australian history lesson package from the Institute for Excellence in Writing (IEW). Over the summer, she’ll do a lesson with a rough copy and good copy once every two weeks or so. I plan to restart the All Things Fun & Fascinating with my son (going into grade 5) in August. I tried this with him when he was in grade 3 and he wasn’t ready. I think he’ll be ready to work on it this year as long as I sit with him when he does it so he doesn’t get sidetracked. French: Both kids write stories of varying lengths. My daughter decided she wanted to write a novel, so she writes 2 chapters at a time (500-700 words total). She types her rough copy, but I make her hand write her good copy in cursive after I’ve corrected it so that she can practice her handwriting at the same time. During the year, she’ll do this every week, but I’m thinking of having her do it only once or twice over the summer since she doesn’t really need extra practice in this area right now. My son (going into grade 5) writes about 10 sentences at a time – typing his rough copy and hand writing his good copy (but in his best printing, not cursive). Because his texts are shorter, he usually writes a rough copy and good copy twice a week, but for the summer that may go down to once a week. French: My son is working through the Apprivoiser la dictée series from Envolée. The books stop at grade 6 and when my daughter finished them earlier this year, I didn’t have her start anything else because she didn’t really need it anymore. My son is also working through Pouvoir d’écrire to practice his printing. English: I’m working through Spelling Power with my son. My kids watch about 30 minutes of French TV 5-6 days per week, mostly on Netflix. I’ve been lax about enforcing minimum amounts of speaking in French outside of lesson time each day and I’m really hoping to get back to that soon! We’re using Math-U-See and Life of Fred. I wrote a post on the Canadian Homeschooler about how I use both of these together. You can read it here. Over the summer, we’ll do math twice a week instead of 4 times a week. 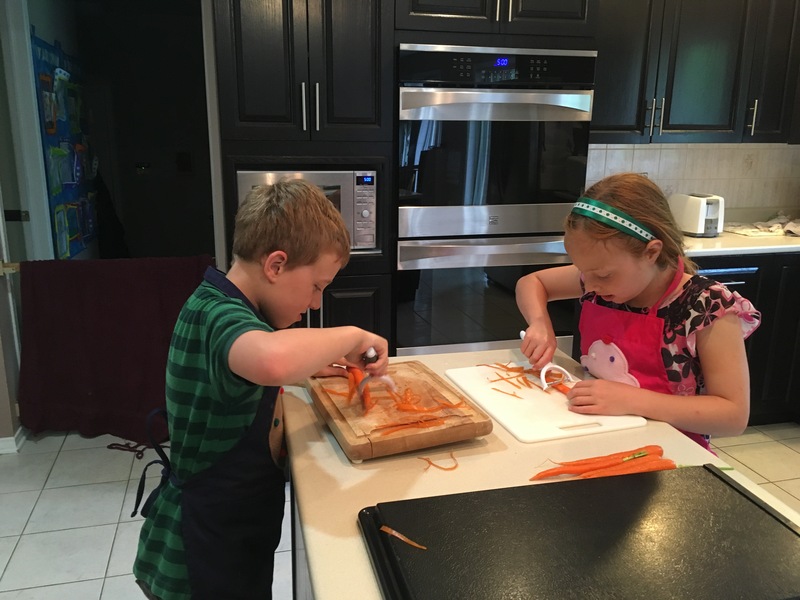 We finished the Kids Cook Real Food eCourse back in January and I’m so glad we did it! I’m having my kids make dinner (varying levels of supervision, depending on what they choose) once or twice a month depending on what we’ve got going on. They are also practicing their egg-cooking skills once every 4 weeks (so with 2 kids I end up eating eggs once every 2 weeks which is my personal maximum before I get sick of them). My son made some tasty fried eggs for lunch today, and my daughter made hard-boiled eggs for egg salad a few weeks ago. I cannot overstate how much having my kids be competent in the kitchen has made my life so much easier. Not only do they help with meal prep, they also chop a LOT of fruits & veggies, which we use for snacks and to take along with us on picnics and lunches out of the house. Such a huge help! I’m no longer running around like crazy trying to do all of it by myself. While I’m packing other stuff, I just put the chopping on their list of stuff to do and voilà beautiful chopped peppers, celery, carrots, cucumbers, strawberries, melons, and more just show up in the fridge in a container ready to go. I’ve lost 33 pounds since New Year’s Eve and I really think that having my kids do part of our family’s veggie and meal prep has helped with that. 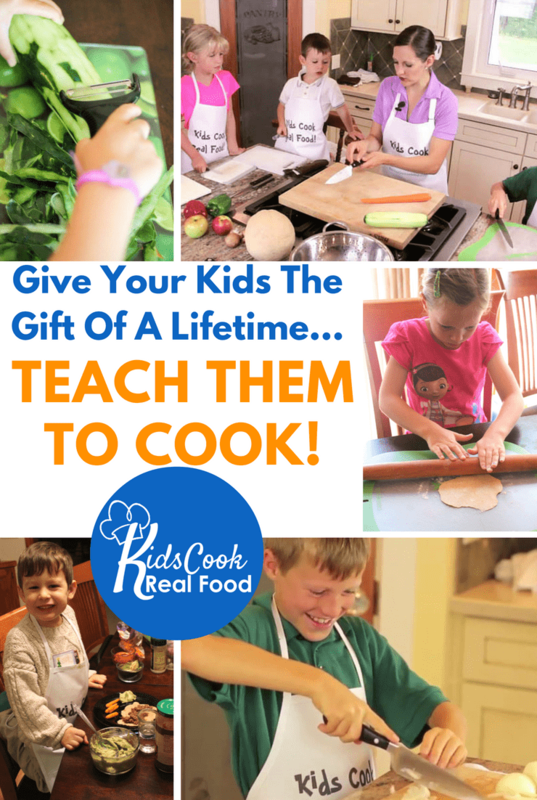 There’s a special deal on the Kids Cook Real Food course right now where you get $20 of premium content videos free if you buy by Friday, June 30th. Check that out here. 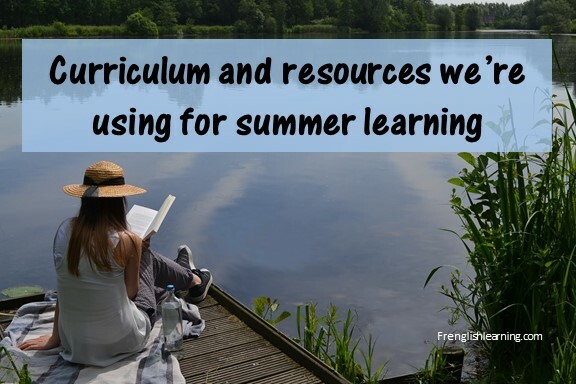 Are you doing any educational activities this summer or taking a much-needed full break? 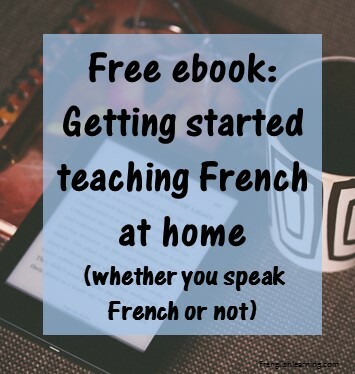 This entry was posted in 11+ years, 4-6 years, 7-10 years, Advanced, Bilingual parent, Curriculum, Immersion, Intermediate, Parent speaks no French, Parent speaks some French by Leanne. Bookmark the permalink.